INSIGHT Into Diversity magazine named Rochester Institute of Technology a Diversity Champion for the third consecutive year. The national distinction aims to identify schools that exemplify an unyielding commitment to diversity and inclusion throughout their campus communities, across academic programs and at the highest administrative levels. Pearlstein will present RIT President David Munson with the award at 5:30 p.m. Wednesday, April 25, at the Fireside Lounge in RIT’s Student Alumni Union. RIT is one of just two universities nationally to receive the Diversity Champion designation to date this year. Selected institutions rank in the top tier of Higher Education Excellence in Diversity (HEED) Award recipients. The HEED Award is presented annually by INSIGHT Into Diversity to recognize colleges and universities that are dedicated to creating a diverse and inclusive campus environment. 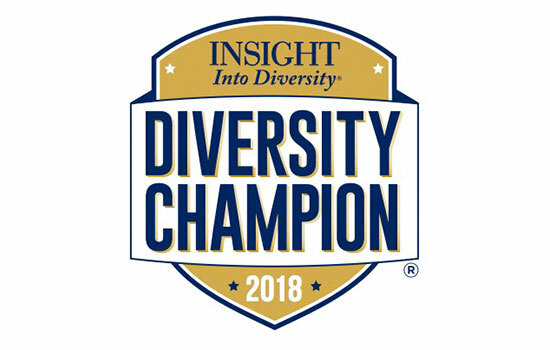 “We are honored to once again be recognized as a Diversity Champion by INSIGHT,” said Keith Jenkins, RIT’s vice president and associate provost for Diversity and Inclusion. “This is a testament to the collaborative work between RIT’s Division of Diversity and Inclusion and our partners in departments, colleges and divisions across campus. We firmly believe that providing more underrepresented men, women and deaf and hard-of-hearing students, faculty and staff opportunities to learn, grow and succeed at RIT will make for a richer experience for the entire community. Over the past several years, RIT has won multiple honors for its campus diversity programming, and several individuals have also been recognized for their personal commitment to diversity efforts both on and off campus. In 2017, the university won INSIGHT into Diversity’s HEED award for the fourth consecutive year in recognition of its focus on diversity through campus-wide initiatives, programs and outreach, student recruitment, retention and completion, and hiring practices for faculty and staff. Last year, RIT was also honored as an institution committed to diversity by Minority Access, Incorporated for the first time. This year RIT welcomed its most diverse freshman class ever. While enrollment figures will not be confirmed for several more days, early counts indicate that 17.5 percent of the first-year class self-identified as people of color from traditionally underrepresented minority populations—African American, Latino American and Native American— up from 15 percent a year ago. RIT’s Division of Diversity and Inclusion features scholarship programs such as the McNair Scholars Program, the Louis Stokes Alliance for Minority Participation, the Higher Education Opportunity Program; academic support including the Multicultural Center for Academic Success, the Native American Future Stewards Program, the Collegiate Science and Technology Entry Program, I’m First and the MOSAIC Center; and outreach programs like the Office for Faculty Recruitment, Upward Bound Classic and Veterans Upward Bound.